Feel Goodery | MMSB = My Mental Scape, Baby! When I was growing up, my family had dinner together every day. Never with the TV on, usually with music playing in the background, glasses of milk for the kids and water for the adults. We sat at the table every night and we talked. Everyone talked about how their days were, what we learned at school, challenges at work, sharing the news about our friends and family; we engaged with each other every day. On Sundays, the same rules applied except that the food was usually more labour intensive to prepare, and we always ate in the dining room on the fine china. They say that you will do what you know, and so it’s really no surprise to me that every night we all sit at the table to have dinner. Although, our fine china is not dishwasher safe like my parents is, so on Sundays we just eat on regular plates. But I digress. It’s been a while, I know. I got busy, you got busy, and while I tried to write I just never had the time to complete a post. And believe me when I say that I have missed you; I really have. In this season of goodwill, can we agree to let bygones be bygones? 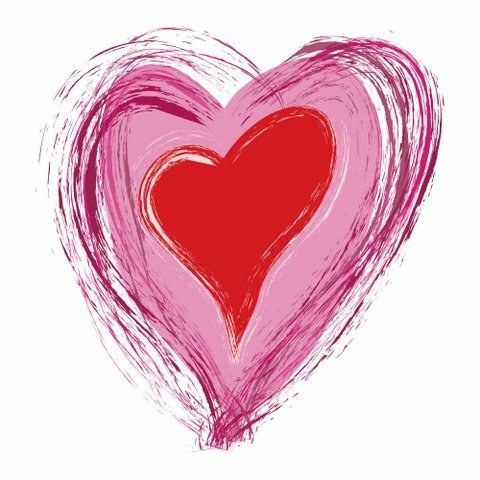 I promise today I’m writing a lovely, heartwarming piece (at least: I hope it is!). While it’s true that I am not what you would call a “Christian”, I was raised as one. As such, I continue to celebrate the major Christian holidays, like Christmas and Easter. While we don’t attend church, we talk with our kids about how Christmas is Jesus’ birthday party and Easter is his funeral and ascension. What this means is that I have a tree. A Christmas tree, every year. Whether it’s real (always has been) or fake (until this year when we got an artificial one), it’s always an old-school, multi-coloured, hodge-podge tree. My tree is a physical symbol of my history. 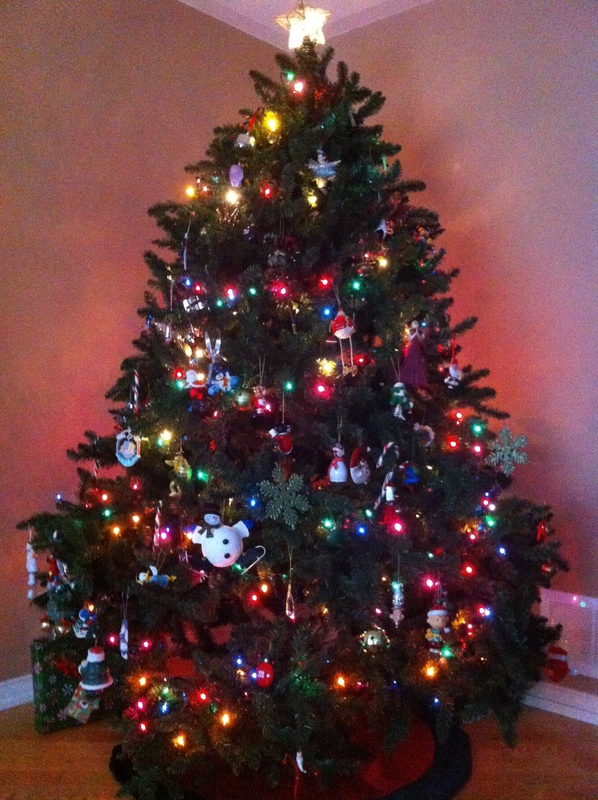 I have ornaments on here from many, many years, including the one from the year I was born. Let me share with you some of my favourites now. It is a star (because ever since my Dad said, “You know why the angel on the top of a tree is always smiling, don’t you?” I have never ever been able to take an angel-topped tree seriously). This star has been with me since I had my first tree on my own, when I was 22. That makes this star 16 years old this year. I bought it at Pier One Imports and I have loved it ever since. It is the best top for my tree. Next: my Sugar Plump Faerie. 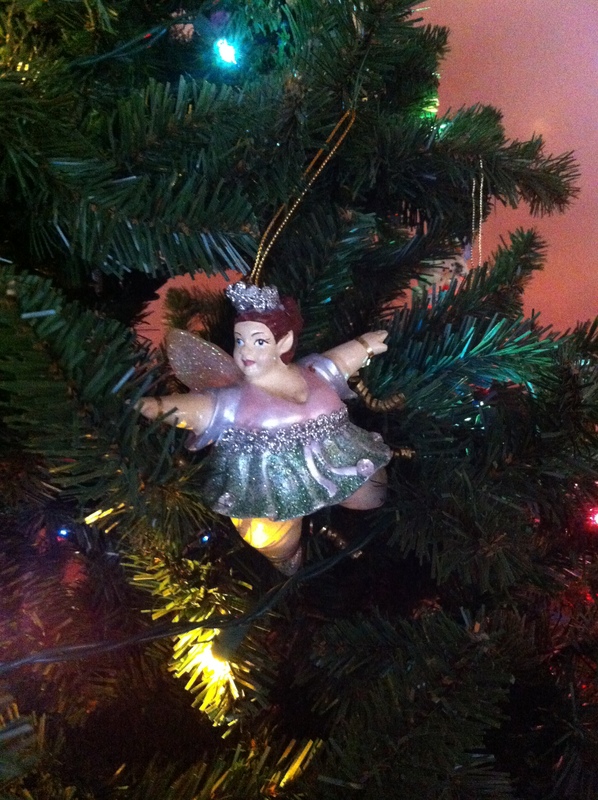 I absolutely adore faeries, and this ornament right here is my all-time favourite. I bought her when I had my first (and only!) Christmas in Halifax, in 2000. MOMD & I moved out east shortly after our wedding so that he could get some traction in his industry. He went to school out there, and all of his network was out there. While we were closer to home for him, we were so far from home for me, and every day away my heart broke. I loved MOMD, and we had some good times out there, but I was not getting better. I moved back on April 1, 2001 and have never strayed far from my beloved city again. But! This is supposed to be about the ornaments, right? SO: I got my Sugar Plump Faerie, as I lovingly named her, from a fabulous little shop in the Hydrostones of Halifax (right next to Salvatore’s pizza which is honestly the best pizza I’ve ever had). I instantly fell in love with her, and every year when I unwrap her, I giggle and clap my hands and admire her. She is confident, beautiful, and dancing. What more can I ask for? My tree is full of angels. I love them – just not on the top! One year, when I was young and single and still adding to my collection, I got it in my head that I needed some “angels in action”. I went on the hunt, and I found one who was singing (pictured above) and one who was playing a trumpet. I was even more excited when the angels were of colour. 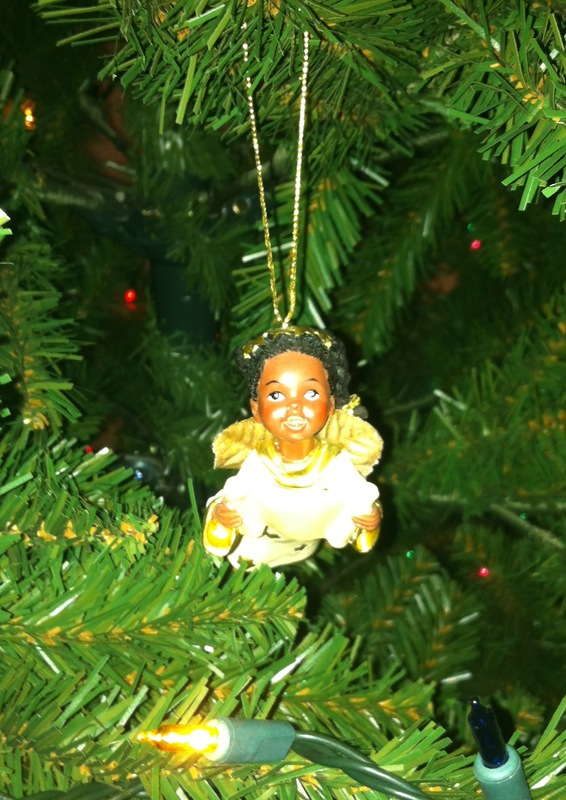 I’m from a big city, with lots of diversity, and it really irked me that all the angels I could readily find where white. Why was that, exactly? And then, I found these ones and my heart was full of gladness. These angels will forever be on my tree, for they own a piece of my heart. You can’t see it, but on this bulb 2004 is engraved. I love the classic simplicity of it. And when I brought it out this year, he too was so excited. His looks a lot like Connor’s, but Sam’s is perfect for him because it plays music. And he is such a music lover, just like his dear old Mum. But please: don’t tell him. Otherwise he’s sure to break the wind-up function from over-playing! Our first year together – 1998 – MOMD & I hosted a Christmas gathering at the house we shared with another couple. We invited people to come and help us trim our tree, and indulge in some holiday cheer. It was a great time. MOMD’s friend came to our house and she brought this ornament for him. It has been a favourite of mine ever since. As you may have guessed, ornaments are pretty important to me. 😉 This one is something that I bought for my brother from the same shop that my Sugar Plump Faerie came from in Halifax. I just love this ornament; I always have. The clock on his tummy actually opens to show a pendulum, and other inner workings. When Glenn died, I asked my parents if I could have some of the ornaments that I bought for him over the years. Of all of them, this one is my favourite. And poignant too, since he passed away 18 months after I gave this to him. Time was ticking away, and we didn’t even know it. And now – an award! My Poppa Award! Yes, this is a picture glued to a Christmas bulb. It is a picture of my grandfather – my Mom’s Dad. When he passed away, a few of my cousins got together and decided to have a little awards show every year, awarding “Poppa Awards” to deserving members of our family. It’s been a great tradition to our annual Keenan Family Boxing day, and every time someone in my house gets one, I get excited and proudly display it. Thanks for giving me an award that could go on my tree, Poppa Committee! As you can see, I love it. I love this one. 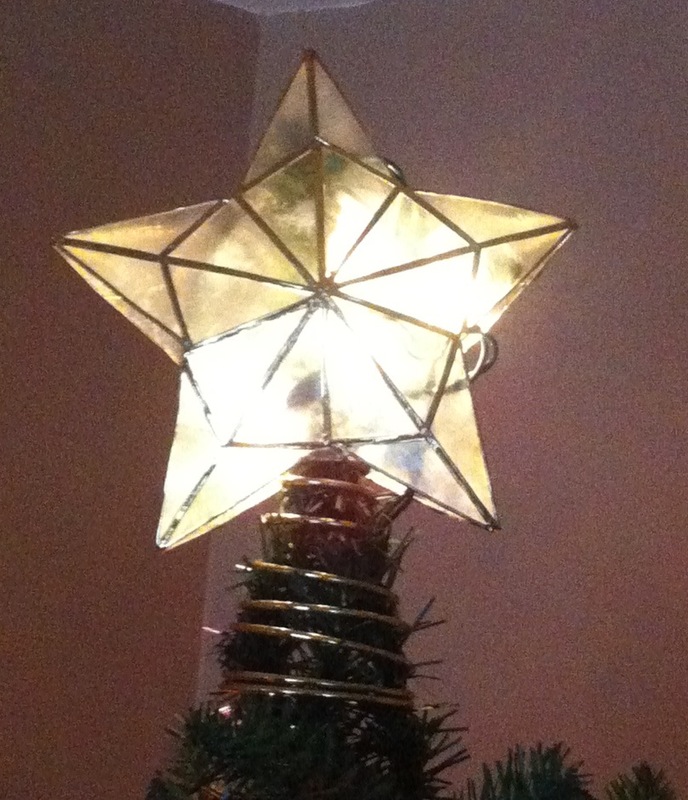 I’ve had this since the year I got my star; it was on my first tree ever, and was a gift from my best friend. Every year she takes my breath away when I unwrap her, and she gets a place of prominence at the top of my tree. Are you still with me? Oh joy! Thank you for continuing on; we’re almost done now I promise! This one is very special to me as it is the first ornament given to me by my mother-in-law, Pauline. It was the Christmas of 1998, and on December 27 I flew to MOMD’s hometown of Labrador, Newfoundland & Labrador to ring in the New Year with him and his family. This ornament was given to my on the night I arrived, and is a cherished item from the first trip I ever made with my in-laws-to-be. Yes, that’s right, it’s Batman. Lest you think that our tree really is just my tree, MOMD does have several ornaments of his own, proudly displayed year after year. And there you have it. Thank you for walking down memory lane with me. I love this time of year, I love my traditions and I hope you enjoyed reading about them. Things have been a little stressful – hectic, even – around here for a couple of weeks. I am feeling the pressure in my business, baby E has been fighting some mysterious virus and just this morning woke up with her first-ever cold. Connor is forgetting to do his homework, Sam is still trying to find his footing as the middle child. MOMD has several projects that are all peaking at the same time and his days fly by in a haze of meetings and revisions. So you know, life hasn’t been the idyllic picnic I prefer. And as you may have guessed when I wrote this whiny complain-y post earlier in the week, I hit the end of my rope. And I know: my life is pretty amazing. I want you to know upfront that I know that. I am grateful for my partner and helpmeet in MOMD, for my hysterically funny children, for my patient and loving family… all of it. What I am most grateful for though are good great friends. For as long as I can remember I have been surrounded by peers who I love and adore. When I was just a little kid, my best friends were my cousins. And of course my sister. We were together all the time, getting into all kinds of mischief. And then in school I made some awesome friends some of whom I continue to share amazing relationships with. Have you ever come to the point though where you stop making friends? I don’t mean casual acquaintances like people you work with but never see outside of work, or parents you see at the school but never go for coffee with. I mean friendships. Just you and another person or two talking about your day/ife/kids and being together in the spirit of friendship. I hit that point in my 20’s I think. I am a mover and a shaker, I am always chatting with people. In grocery stores, in lineups, on the street, at the park. If you’re in the same space as I am you can pretty much bet I’m going to say something to you. I stopped adding people to my life though; I didn’t take it beyond the acquaintance level after like 1998. I never thought twice about it. My life was full, there was always someone to hang with in a bar on a Friday night, I was happy. Once Connor was born in 2004, I wasn’t really looking for people to hang in bars with anymore. Lucky for me though, my dear friend Jill had her baby 6 weeks before I had Connor, and my sister was pregnant with my niece too. We were all on maternity leave together, and Jill had a mini-van, and the 3 of us and our babies spent the year together, going where ever our hearts desired. It was awesome. Enter the greatest thing to ever happen to me that year (aside from Sam’s birth, of course): MumNet. I started joining things. Groups for Moms. Specifically Mumnet and “Songs by Sally“. And I mean it: this was the best thing that I ever did. I established some deep bonds with several women who I would have otherwise never met. And these women are so important to me now. Some of them have had other children since 2004, some of them are pregnant now. Some have returned to work, and some others are staying home. We really don’t have a connection to each other aside from our kids, but man… in 2004 these women were literal lifelines for me. And today, they are just as important. So like I started to say, it’s not been a great couple of weeks. MOMD is truly a darling; on Tuesday he called from work to say he wanted to take some vacation time so that I could get the hell outta doge and just rest and recupperate, “Whatever you need to do,” he said. I had spent time with a couple of these friends I made when Sam was born on Monday and I tell you what: it was a godsend. They reminded me that it gets better and I don’t have to be the only one to provide comfort; Miss E had a lovely nap on Suzy’s chest. Tuesday night I met up with another group of women who I collected when Sam was born and man… I haven’t seen most of those women in a year – one of them more than 2 years – and we picked up like no time had passed at all. My soul was restored. I was built up. I built up others. We connected, we shared, we drank wine and ate wonderful food and it was… good. MOMD can use his vacation days for something else. It turns out, all this girl really needs is her Girls. I started this post a few days ago, when I was in a mood created mostly by what was happening in my world (anyone with children of any age – your own or ones you rent – can relate to this for sure). I felt that no one was listening to me. Mostly because, they weren’t. I spend my whole day with my kids. Kids are, by nature, very selfish little creatures. They do what they want, demand what they want, and if it is not provided post haste, they let you know how you’ve failed them in the loudest and most obvious of ways. I get that. It’s what they’re programmed to do until enough time, experience and grooming from parents and caregivers shows them that in fact, they are not the only people in the world. Writing this blog is a place for me to express silliness (like this, or like this even), my fears (like this, and this), my indignation (like this and this too), my sadness (like this), my gratitude (building it up, like here or expressing it freely like here) and really, just any emotion I am feeling at the moment. I appreciate you for reading what I write, because even if you don’t comment, I see that you were here via my stats page. If you do comment, I love it because I know that I’ve struck a chord – good or bad – with someone else, and we can have a discussion (if not an actual conversation) and I know for SURE then someone’s listening. I guess really, I was only making one good point in the post I started out on Tuesday. That was this: I am so grateful for you, my reader! Thank you for taking a few minutes from your day to read – and sometimes engage in discussion with me – about what’s going on in my life. That simple, passive act on your part has given me immense comfort. I want you to know just how thankful I am for you. I was away over the weekend on a retreat with my business. 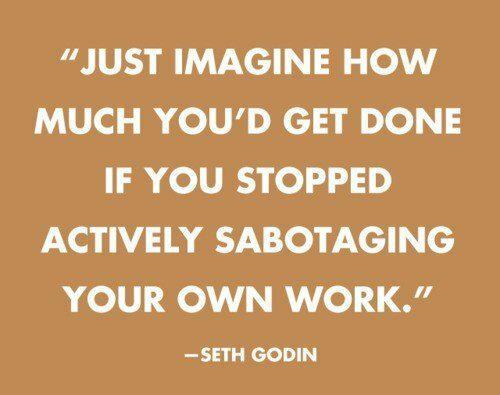 One of the best parts of what I do is that it really is a personal development business. I am challenged to stretch myself, to move beyond my comfort zone, and attain new understandings of myself – on a continual basis. It’s fantastic. And this weekend was no different. One of the trainers (Halla back, Kelly GT!) introduced a really neat concept. ANTS: Automatic Negative Thoughts. The idea is that we all have thoughts. All the time. (You wouldn’t argue that, would you?) Sometimes we are aware of what we’re thinking, and sometimes we are not. It’s really just this constant stream of chatter in our heads, which is why we are often not aware of it. The first thing we need to do is tune into what we are thinking. Often, first thing in the morning, my chatter sounds like this: “Oh… all ready? I’m not ready to get up… I want a few more minutes. Of course, those lunches aren’t going to make themselves. And I don’t hear the kids up here getting dressed, which means that we are all ready behind schedule, so I should get myself going so I can get them going too. The light coming through the window looks a little grey but oddly bright… Oh God please tell me it didn’t snow last night! I’m sick of the winter!! Where is the spring anyway? I have some shoots in my garden from the bulbs that Sam & I planted last fall: if the snow kills them I will be crushed” And so on. It’s not positive thinking, it’s not neutral thinking, it’s negative. I’m thinking about what I don’t want. And these are the first thoughts that I have in a day, which set the tone for the rest of my day. These thoughts are automatic; they are ANTS. We all have infestations of ANTS. We need to get in there like an exterminator, and exterminate them! Because it is true that what you think about, you bring about. So how do you go about exterminating your ANTS? You do it by finding positive thoughts to replace the negative ones with. For some, this will be challenging. In that case, you have to start by talking to the people who know the whole you (not just the mom/dad, the wife/husband, the coworker, the friend, etc), asking them what it is that they love about you. What the trainer actually said was, “Ask them what makes you fabulous!” The idea is that these people will be able to give you an arsenal of great, positive things about you – that you maybe don’t even see in yourself – and these become the tools in your ANT extermination. I really love this idea. I know that I can use some positive statements about myself – it’s been a long winter, and I am hard on myself at the best of times. I’ve made my list of people to ask, and have even asked one of them all ready. I encourage you to do the same. Make a list, get in touch with the people you want to ask, explain to them what you are doing (so they don’t think you are looking for an ego-stroke), and ask them to tell you what makes you fabulous. You will be amazed at the feedback. I bet you even get an Automatic Smile on your face.